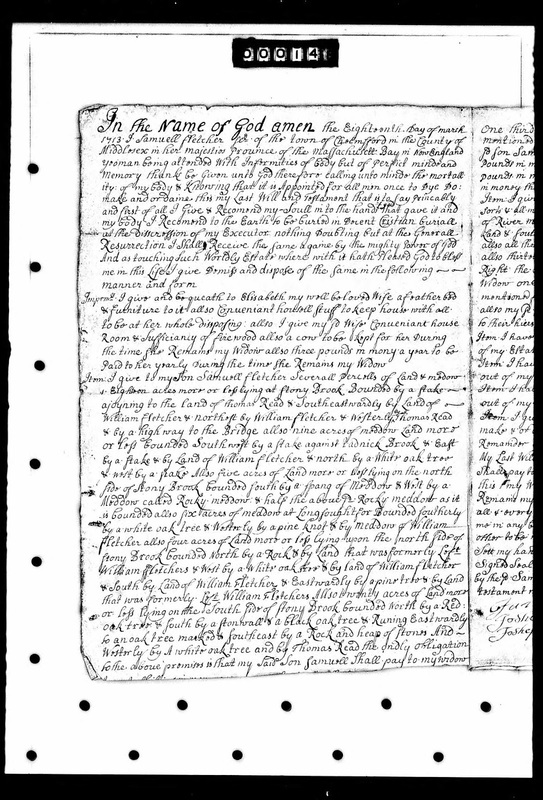 This week's document for Amanuensis Monday is from the Middlesex County, Massachusetts probate documents for Samuel Fletcher (1652-1723) of Chelmsford, Massachusetts. Resurrection I Shall Receive the same againe by the mighty Power of God. Paid to her yearly During the time she Remains my Widow. allso all the Remainder of my river medow lying in the River medow abovesd. to their hiers with in one year after my decease. of my Estate Except ten shillings which I here Will unto her. out of my Estate Except ten shillings which I here Will to her. out of my Estate Except ten shillings which I here Will unto her. Sett my hand & seale the Day & year above written. judgm^t. But the other two ?????? upon y^r Oaths to declard ???????? of sound & disposing mind – wherefore I refuse the Probate of this will. 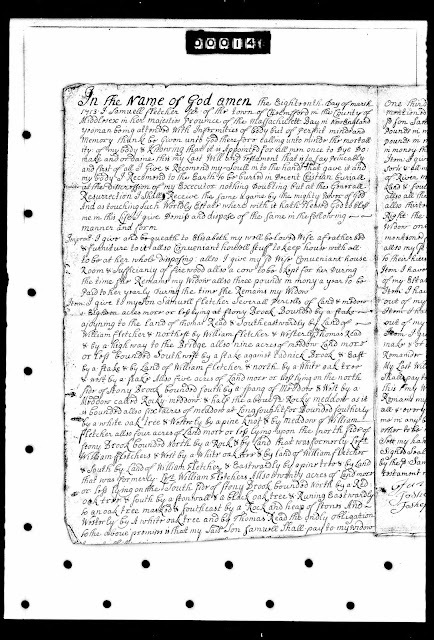 "Middlesex County, MA: Probate Papers, 1648-1871," digital image, Ameircan Ancestors (http://www.AmericanAncestors.org : accessed 3 May 2017), Probate Packet #7,920, Samuel Fletcher of Chelmsford, 1723. 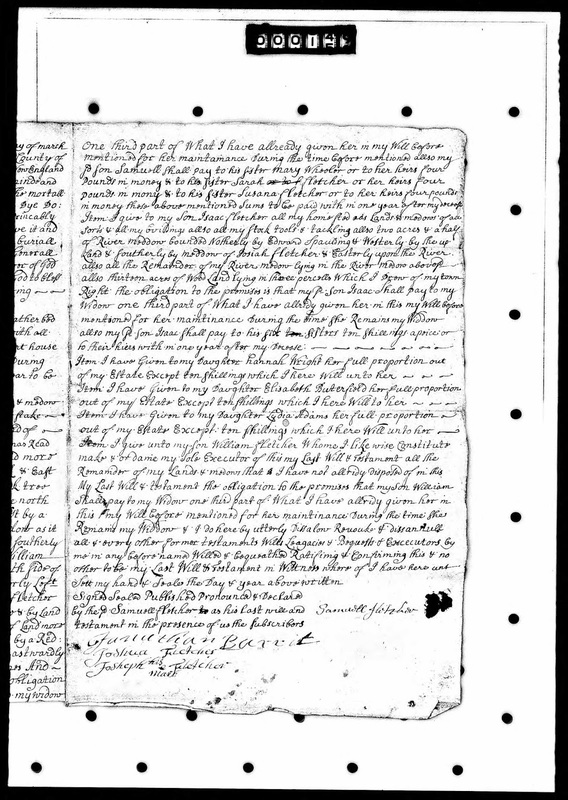 The will of Samuel Fletcher (1652-1723) was written on 18 March 1713, and he died before December 1723 when his widow complained that she was alone and unable to manage the estate. In the will, Samuel Fletcher named his current (third) wife, Elizabeth, and three sons Samuel, Isaac and William Fletcher; and six daughters Mary Wheeler, Sarah Fletcher, Susana Fletcher, Hannah Wright, Elisabeth Butterfield, and Lydia Adams. 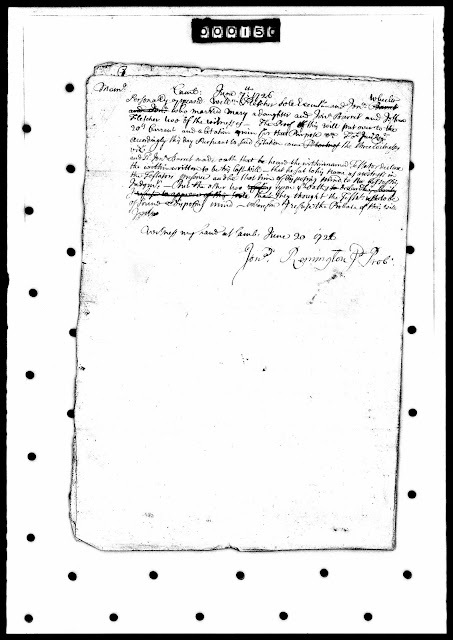 The will was not probated because two of the three witnesses would not make an oath that Samuel Fletcher was of a sound disposing mind when they saw him sign the will. This was on 20 June 1726, 13 years after Samuel Fletcher wrote the will and two years after he died. There are more papers in the probate packet, and I will transcribe them in Part 2 of this series. Samuel Fletcher (1652-1723) and his first wife, Hannah Wheeler (1649-1697), are my 7th great-grandparents, through their son Samuel Fletcher (1684-1749) who married Hannah --?-- in about 1712, and had nine children.